Juicing | Whole Food. Real Food. Good Food. Of all the new things we have tried since February, I am the most excited about juicing. My husband and kids surprised me with a juicer for Mother’s Day this year and we have been juicing ever since. 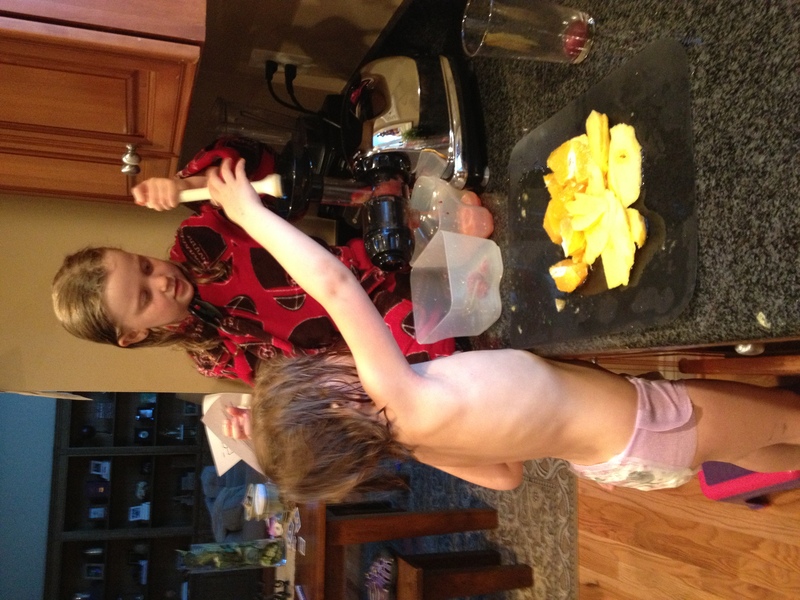 The two most exciting things to me about the juicing is the amount of energy & mental clarity it provides and how much my kids enjoy juicing and making their own recipes. 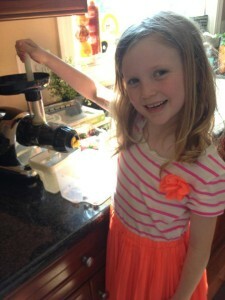 My 3-year-old asks on a daily basis if she can “make her recipe.” It has gotten them excited about fruits and vegetables! (Mostly fruits, but we are slowly working in the vegetables). In talking to my friends about our juicing adventures the four most common questions are about what juicer to buy, is it a pain to clean, why is it beneficial and how does it taste. So friends, this blog is for you :). There are basically two different types of juicers you can buy, a centrifugal juicer or a masticating juicer. My husband did a lot of research before purchasing the juicer and he came to the conclusion that a masticating juicer was the best option for us. Once he narrowed that down, he made his decision based on availability (he bought it the day before Mother’s day so needed it quickly) and price. There are so many juicers to choose from, we have no other juicer to compare with ours and we are far from the experts on the subject, but we are very happy with the one he chose — we have the Omega J8006 Nutrition Center Juicer. This juicer is extremely easy to assemble, operate, and clean. I have read countless blogs and articles about different juicers and most of them recommend different ones, so it is very difficult to figure out the “perfect” juicer. 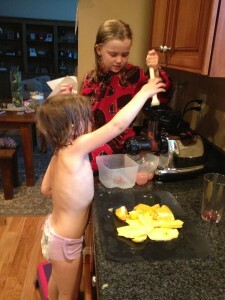 So, all I can do is talk about our juicer and the benefits we have found from it. Here is a good site to read about different juicers and price compare. A centrifugal juicer spins at high speeds. During the spinning motion, the vegetables are ground to a pulp. The spinning motion then forces the juice away from the pulp. The juice then pours into a bowl. Masticating means to chew, to grind or knead into a pulp — a masticating juicer grinds vegetables and literally squishes out the juice. Since a masticating juicer works at low speeds and with no spinning action, it tends to juice many vegetables more efficiently. Although I cannot personally compare, I have read on various sites that a masticating juicer tends to be a lot more quiet, less messy and easier to clean. 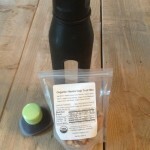 I learned a lot about juicing and its benefits from the Gerson Institute. Gerson Therapy is a natural treatment that boosts the body’s own immune system to heal cancer, arthritis, heart disease, allergies, and many other degenerative diseases. Dr. Max Gerson developed the Gerson Therapy in the 1930s, initially as a treatment for his own debilitating migraines, and eventually as a treatment for degenerative diseases such as skin tuberculosis, diabetes and, most famously, cancer. Centrifugal juicers expose the juice to heat and oxygen, killing off the essential healing enzymes in the juice. These juicers have difficulty in juicing leafy greens. Without the pressing action to extract the juice, many minerals and phytochemicals remain in the pulp, so the juice rendered is less rich in healing nutrients than juice from masticating juicers. Centrifugal force is less effective in extracting juice than the pressing action of other juicers, meaning that more produce is required to make less juice. An inefficient juicer may be cheaper in the short term, but will be more expensive in the long run, as it necessitates spending more money on produce. If you decide to purchase a juicer, I highly recommend following Drew Canole on Facebook. If you do not have a Facebook account, you can visit his website. I have learned so much in the past month about juicing from his site. One of the most important things I have learned from him are the benefits of live juice. 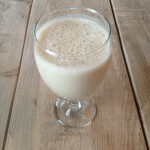 This information and a compilation of his recipes can be found in his book Juicing Recipes. According to Drew, the body needs live food to build live cells. When we eat live foods, our bodies consume the liquid immediately and then pass on to the lower digestive tract all of the excess. He compares juicing to an IV of energy-rich foods pumped immediately into your organs, supplying all the quintessential nutrients you need for the day. The juice from the juicer is much better for you than any juice you can buy from the store, or even at the local farmer’s market. When juice sits on a counter or in the fridge, it oxidizes and loses the lion’s share of nutrients. Plus, juice from a juicers is not pasteurized, meaning it isn’t cooked or boiled to help it stay on the shelf longer. The fresh juice is literally bursting with live energy ready to heal, pump, and energize you all day. – Information provided by Drew Canole. If one of your goals is to get greens into your kids, like spinach and kale, my recommendation would be to incorporate these into a smoothie rather than a juice. The juice will probably be too strong for the kids to handle. 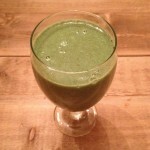 Here is one of our favorite smoothie recipes that incorporates kale and spinach. As far as taste is concerned, it tastes like what it is :). To be brutally honest, with some of the recipes, you have to just guzzle and not think about it. My son had hockey tryouts this morning so I made him carrot, apple and cucumber juice. He didn’t love it, but I told him to hold his breath and drink it quick and he did. It is amazing how fast it goes down. I am guessing because it is so pure, it is really easy to drink. 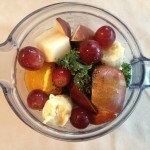 When starting with your kids, or even yourself, add some fruits in with the vegetables to sweeten the juice. I have found that pineapple is a great accompaniment to kale and dandelion greens, it really takes the edge off the bitter greens. One more thing to note it the type of produce you purchase. It is very important to purchase organic. Avoid juicing anything that is not organic. It is better to not juice at all than to juice vegetables that are non-organic. When you juice, the contents hit your bloodstream within 15 minutes — juicing non-organic is like giving yourself an injection of pesticides and herbicides. You will always need to peel citrus fruits regardless if they are organic or not. You do not need to peel ginger or beets — you can even juice the leaves of beets which are full of wonderful minerals and nothing goes to waste! There is so much more information out there and so much to learn, so this is just the very tip of the iceberg. I hope this helps those of you that had questions about juicing. If you do decide to juice, I would love to hear about your experience. It has been nothing but wonderful for us — we feel so healthy and full of energy and my wish would be for everyone to feel this way.